FBN's Stuart Varney on President Trump's handling of North Korea. No way round it: That was historic. And it wasn&apos;t just a symbolic handshake. The president and Kim Jong Un signed a ground-breaking agreement. They are going to work towards complete denuclearization of North Korea. The president acknowledged it would take years. During that process, sanctions stay in place. So the economic pressure remains. Hard line trump. The agreement called for, and Kim Jong Un signed on to, a stable, peaceful regime in North Korea. That’s a Kim reversal. 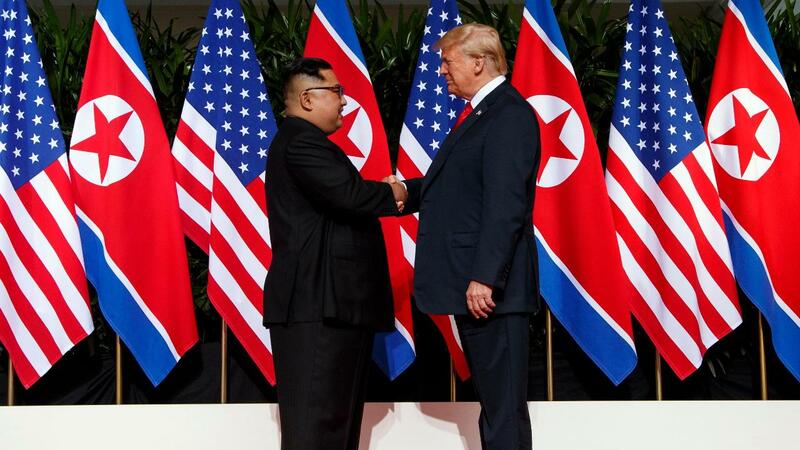 Verification: the agreement did not use the words "verifiable" and "irreversible," but president trump in his press conference said American and international observers would be in North Korea to check. Getting rid of the North Korean nukes is at the heart of this deal. And both sides have agreed to it. Add it all up, and it is a remarkable turnaround. When first elected, Mr. Trump was widely portrayed as a warmonger... Remember the pundits assuring us that soon we&apos;d be at war with North Korea. You can&apos;t say that now. And what a remarkable switch in diplomacy. The Europeans are left out, not even mentioned in the agreement. The Iranians will be watching: They will look at what Kim gets for an agreement with Trump. And so will the Russians. New sanctions have just been applied to them, and Mr. Trump is talking about a Putin summit. Lots of moving parts in Trump&apos;s diplomatic world. One last point: The president&apos;s style surely had a lot to do with this history-making day. Kim Jong Un would not have come to the table if he thought he could bamboozle this president. He knew "hard-line Trump" was no game.